PRATTVILLE, Ala. (June 13, 2018) – The four-member nursing team at The Harbor at Hickory Hill was recognized on National Nurses Week, May 6 to 12, with the gifts of a new Littmann® Stethoscope, a personal note and a bouquet of flowers at each one’s nursing station in appreciation of their dedicated service. National Nurses Week, an initiative of the American Nurses Association, recognizes the significant contributions of nurses to the health and wellbeing of others. The week concludes with a special day in remembrance of Florence Nightingale, the founder of modern nursing. “Our nurses are the backbone of our care for our residents. We want our nurses to know how much The Harbor at Hickory Hill team, residents and family members appreciate all of their dedicated work to serving the greatest generation with excellence,” executive director of The Harbor at Hickory Hill, Christy Goodwin, said. The nurses recognized were: Carol Salamon, Michael Collins, Michelle Harrison, and Cathy Faas. “We could not provide the highest standard of care without our team of nurses. We wanted to express our gratitude for each of our nurses in a memorable way. They deserve to be celebrated, and we are glad that we are able to take the time to celebrate them,” said Melissa Boatwright, director of clinical support of Legacy Senior Living. Located at 2102 Summit Parkway, The Harbor at Hickory Hill is a premier memory care center that is in Prattville, Al., that offers Alzheimer’s and dementia care services in a safe, attentive, home-like environment. The facility, which is conveniently accessible to all points in Prattville, is committed to serving the greatest generation with honor, respect, faith and integrity. More information is available at hickoryhillharbor.net or by calling (334) 361-5111. 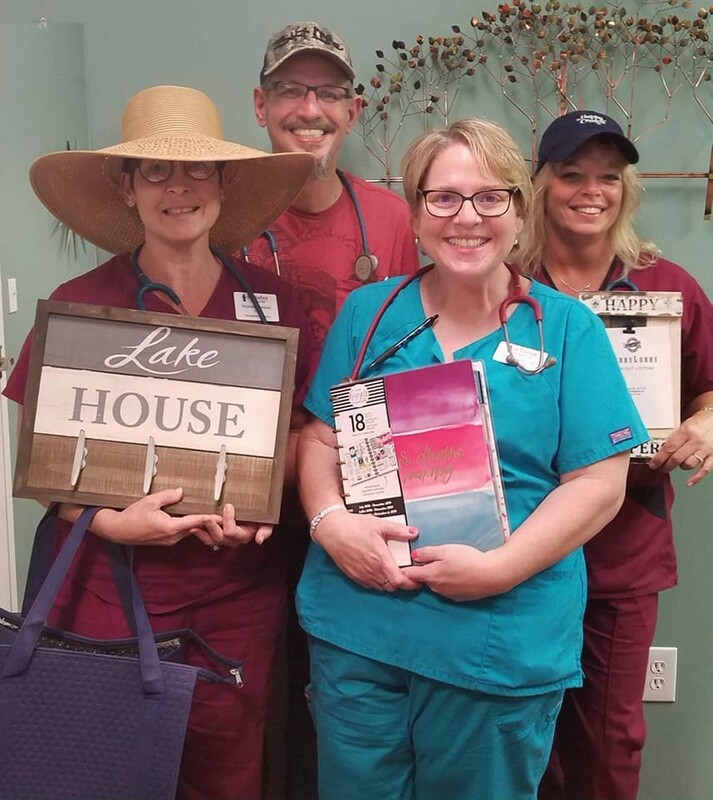 Photo caption: PRATTVILLE, Ala. (June 13, 2018) – The four-member nursing team at The Harbor at Hickory Hill was recognized on National Nurses Week, shown here (l-r): Carol Salamon, Michael Collins, Michelle Harrison, and Cathy Faas. We could not provide the highest standard of care without our team of nurses.